For a few weeks in September 2015 my best mate had been coaxing me into joining the newest all-inclusive club in Glasgow – the Glasgow Alphas. Since I was 23 I have been heavily involved in sport in both my personal life and working life, but rugby is one activity I had never thought about taking up. On one cold September night I went along with my best mate to Whitecraigs RUFC in Glasgow; sitting in the changing room surrounded by a group of guys I had never met was, at first, unnerving. Since I came out I have found it hard to be around guys as I guess I always thought, even in the LGBTI community, there would be a lad bravado attached to such sports as football and rugby. Because of this 99% of my friends all my life have been female. However, my initial attitude could not have been more wrong. For years I’ve been shy when it comes to guys and if you put me in a room full of men I would fade myself into the background; now, because of the Alphas, this is no longer the case. ‘I’m much more confident in myself and my skills, and I’ve come to understand that my outsider’s view of lad bravado couldn’t be more different to reality because, to be honest, it isn’t there. Our club is the same as any other sport, be it football, rugby, hockey or running: it’s a group of LGBTI people coming together to play a sport, to get fit and to form a team. The Alphas have truly changed me: not only am I much more confident when doing sport as a whole, but I now have a group of friends I am more than proud to call my brothers. 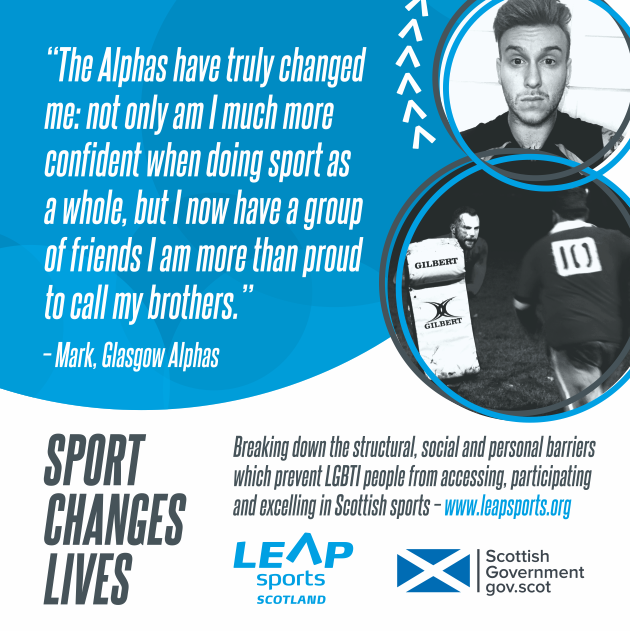 Glasgow Alphas are Glasgow’s first and only LGBT inclusive rugby club. Established in September 2015, we primarily provide a comfortable and relaxed environment for anyone to come and give rugby a try, while also promoting LGBTI inclusivity within sports in general and the wider community. Written on 3rd January 2017.